In China, we live in a time of absurdity unparalleled in history. It is particularly so because everyone knows its absurdity and ridiculousness, but still carries on nonetheless. This is because China is still a one party dictatorship under the Communist Party. The CCP has committed many atrocities that make people hate it bitterly. However, China today is very different from the Mao era: the ideology of the Communist Party has not only thoroughly been bankrupt for a long time, but it has changed beyond recognition. More and more of the common people see through the Party’s cheap tricks. The autocrats are outwardly strong but inwardly weak, they are asses in lion’s skin, and they have a guilty conscience when doing bad things. They are not only shameful, but also laughable. Arthur Schopenhauer once said, people cannot help but laugh when they suddenly discover that something is not in line, its inside and outside are not consistent, it is a self-contradiction, it attends to one thing and loses another, and its inconsistencies create a sharp contrast. The Communist Party says one thing and does another, is one way on stage and another off stage, and is one way yesterday and another today. Its lies are apparent everywhere you turn, so are its absurdities. The Chinese Internet is awash with jokes, satire and humor every day. Among these, most are very political, whether they are directly aimed at the regime or the many kinds of corruption and ugly phenomena in Chinese society. 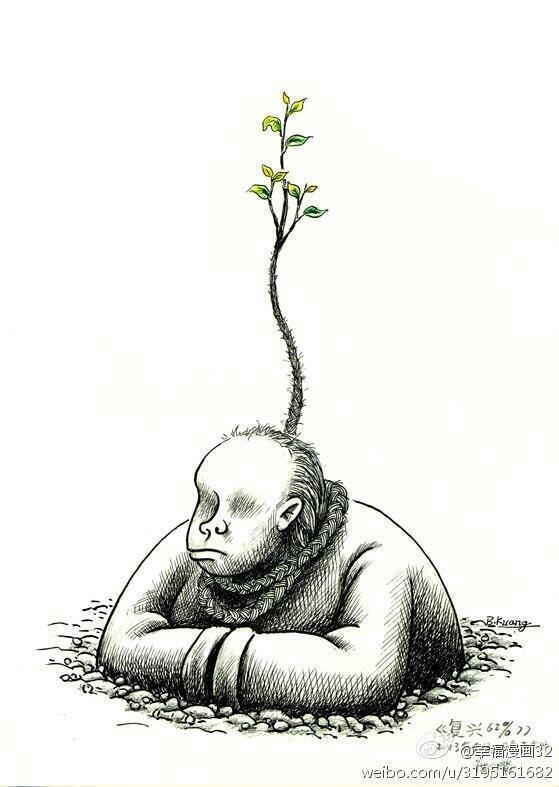 Absurd reality makes many people into satirists, humorists, and joke kings, and life itself provides us with an endless supply of superb material. The best kind of humor and satire is the kind that touches on reality, especially on power. Some people might say: why mock power in particular? Isn’t it enough as long as it’s funny? Well no, because this has to do with the essence and significance of laughter. Seemingly frivolous, laughter actually derives from a deep and serious emotion: pride (Montesquieu and Baudelaire have both pointed this out). Laughter allows us to place ourselves above the things that we laugh at. If you laugh at someone, it shows you are wiser than that person, at least in some aspect. We often see city dwellers making fun of country folk, locals making fun of outsiders, healthy people making fun of cripples, men making fun of women, etc. Thus, fear of people laughing at you is a fear of people looking down on you and belittling you. In some television programs, the content itself is not funny, it is humorous only because the actors use a dialect. This demonstrates the notion that Mandarin is superior to dialects. It is precisely because laughter shows our pride, shows that we are better than others, that some jokes, despite being funny, can appear to be harsh, unkind, and snobbish. It is easy to poke fun at poor people, country bumpkins, or the handicapped, but doing so can also invite people’s disgust. There is only one kind of joke that does not have this problem, that is, jokes directed at power. Because power looms high above the masses, because where there is power there is inequality, laughter is needed to balance things out. By making fun of power, people claim their sense of equality. Thus, ridiculing power almost has a natural legitimacy to it. In democratic nations, political jokes always mock big, powerful figures. The jokes aimed at authoritarian power, needless to say, are even more legitimate. Authoritarian power is not chosen by us but forced on us by dictators. Dictators need to sing their own praises and put feathers in their own caps (as in “great, glorious, and correct,” “vanguard,” or “three represents”) in order to show that they have the qualifications to rule us. Ridiculing authoritarian power is to strip it of the moral gilding it wraps itself in, and to deny that that power has the qualifications to rule us. As such, ridicule constitutes a challenge to power. Mocking authoritarian power is rejecting its legitimacy, defending our dignity, and, to some degree, beckoning democracy. 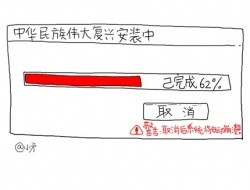 “The renaissance of the Chinese nation is 62% complete,” by Kuang Biao (邝彪). Under the same circumstances of being the target of a shoe thrown while giving a speech, American president George W. Bush could brush off the incident with a joke. But Chinese Prime Minister Wen Jiabao felt compelled to put on an incomparably serious expression and counterattack in the most self-righteous and severe manner. This is not because Bush has a sense of humor and Wen does not, and it has nothing to do with the difference between Eastern and Western culture, but rather, it is because of the difference in the nature of their power. The president of the United States is not afraid of someone criticizing or mocking him to his face; ridicule will not influence the legitimacy of the president. Even if he wants to suppress it, he does not have the ability to do so, so he might as well be magnanimous in the face of criticism and stay cool when ridiculed. On the other hand, authoritarian rulers cannot afford such insouciance, and what exasperates them most is the disrespect of others. The power of CCP leaders obviously does not come from the people, but they must pretend it is from the people, and they cannot stand being publicly ridiculed by the people. They must immediately confront head-on the public criticism and sarcastic disagreement of others, making those who openly criticize, disagree or ridicule them into hostile forces, or at the very least imply that they harbor ill intentions. If they use a relaxed and friendly attitude to handle critics and satirists, they fear it would make people feel like it is acceptable to criticize and ridicule them. In an anecdote from modern art history, the French artist Marcel Duchamp placed a urinal into an art gallery, and by doing so turned the urinal into art. By taking something you are accustomed to seeing, dissociating it, and turning it into an exhibit, you give the object special significance and experience it differently. Any snippet from life, something that could not be more common, if focused upon, becomes satire or art. It can shake and shock the world. Two years ago Hu Jintao toured an elementary school during his official visit to Japan. One kid asked him, “Grandpa Hu, why do you want to be the chairman of the country?” Hu Jintao answered, “Child, let me tell you, I don’t actually want to be the chairman of the country. It was the people of China who chose me to be the chairman. I cannot disappoint the people of the entire nation.” He was being ridiculous of course. But when we read the news coverage, we probably didn’t experience an intense feeling of absurdity because we had all become so accustomed to such lies for so long that we were numb and indifferent. One day though when I saw a video online with this scene in it, I laughed. I thought: if someone produces a skit which broadcasts this segment of Hu Jintao over and over, the absurdity of it will come through. Show it, for example, to visiting Chinese government officials, have Chinese ambassadors and consuls watch it, have Hu Jintao himself watch it, play it three times in a row, I don’t think they would be able to hold a straight face. They would be as uneasy as if sitting on pins and needles. In today’s China, since we still do not have real freedom of expression, the best political satire and humor are still unable to shine in print media, on stage, and on television. This is no doubt regrettable, but on the other hand, it is precisely because we are still under a strong-handed rule that satire and humor aimed at dictatorial politics are what the masses enjoy most and have the most strength. Little wonder that political satire is thriving on China’s Weibo, the equivalent of Twitter. Anonymous but highly talented satirists and humorists emerge online every day, spreading their jokes far and wide and making hundreds and thousands of us laugh. Mark Twain said it well: “The secret source of humor itself is not joy but sorrow. There is no humor in heaven.” In today’s China, the plight of the people is lamentable. In real life, they are often helpless, contradicting sharply with their rising civic awareness and sense of dignity and justice. It is precisely from this intense sorrow that “dark humor with Chinese characteristics” derives: it is seemingly cynical but, deep down, very serious; it looks relaxed and happy, but in fact is incomparably heavy; it is sometimes vulgar in form, but what is expressed is quite civilized; it is not just cathartic, it is at the same time constructive. Modern Chinese political history, psychological history, literary history and art history, I believe, cannot be complete without discussing satirical humor. Those endowed with the right talent ought to seize the moment, for there is no better time or place to be a mocker. 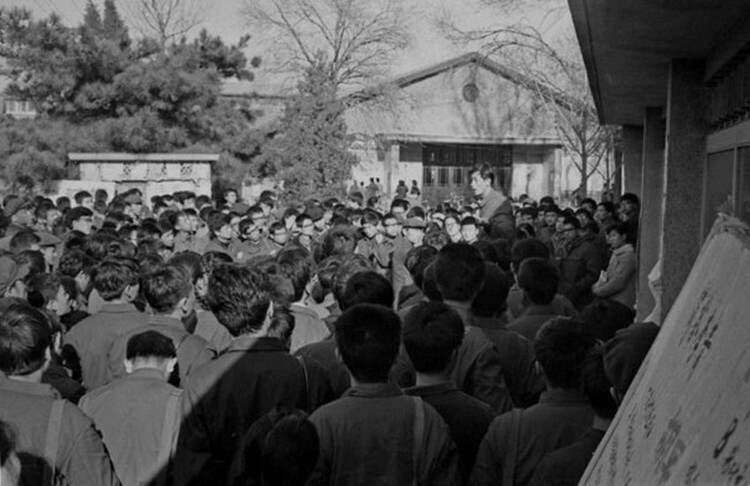 A scene from the district people’s representative elections at Peking University in the fall of 1980. Mr. Hu Ping was a graduate student of philosophy at Peking University in early 1980s and a leading candidate in the elections of the people’s district representatives that swept across the campus in the fall of 1980. 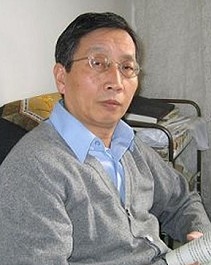 One of the most respected dissent intellectuals, he now lives in New York and edits Beijing Spring (《北京之春》), “a monthly Chinese-language magazine dedicated to the promotion of human rights, democracy and social justice in China.” With the author’s permission, this is a translation of an abridged version of the original. By China Change in Analyses and Opinions, Political Transition on August 17, 2013 .